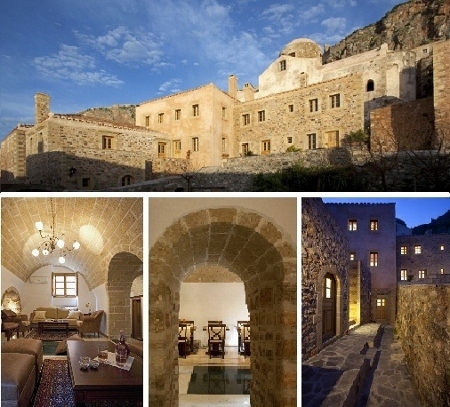 In Chrisafitissa square, inside the Castle of Monemvasia, we have built LIKINIA Hotel. The hotel ‘s location, in Chrisafitissa square which is adjacent to the walls over the sea, is offering a magical sea view. LIKINIA Hotel is a beautiful complex of four 2-floor buildings made of stone. The careful restoration of the buildings was done with full respect to the traditional architecture of the Castle of Monemvasia. The hotel ‘s traditional architecture is combined with high quality furniture and services, with the focus to provide a comfortable and relaxing stay to the hotel ‘s guests. The suites of LIKINIA Hotel and the Castle of Monemvasia is also an ideal destination for newly-wed couples. In the beautiful stone-built arch, you will enjoy your breakfast made of fine ingredients, as well as selected local products. Τhe hotel ‘s lounge is ideal for the summer months, as the guests may relax under the stone built arch, as well as for autumn and winter, when guests may enjoy a relaxing during by the traditional fireplace. Either you wish to relax and enjoy the calmness of the area around Chrisafitissa square, away from the busy central road of the castle, or you prefer to be inspired by the history of the castle and the beauties of the surrounding areas, we will be at your service to ensure a relaxing and pleasant stay.